Is summer not the best season of the year? Spending time at the beach house, sleeping in, bike rides to breakfast, lazy days with a good book, warm summer nights, cocktails at 5, and my favorite, outdoor entertaining. What's not to love? 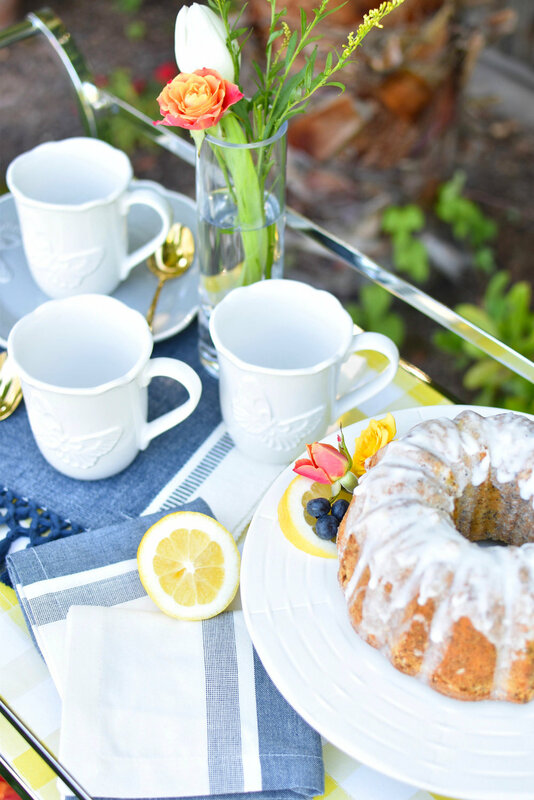 To celebrate my favorite time of the year, I teamed up with Lenox to throw a charming little garden party! I always say, pick a color or theme and run with it. A direction keeps you more organized and focused, which also means you'll have more fun planning and partying. I've had a real thing for blue and white this year and couldn't wait to bring it to this table, but obviously, this white pattern works with any color palette. I’m a huge fan of taking full advantage of the colorful flowers and fruits of the season to do the work, so when it comes to setting a summer table, you'll typically find fresh lemons and limes, cherries, watermelon, peaches, blueberries, or flower petals in the mix. 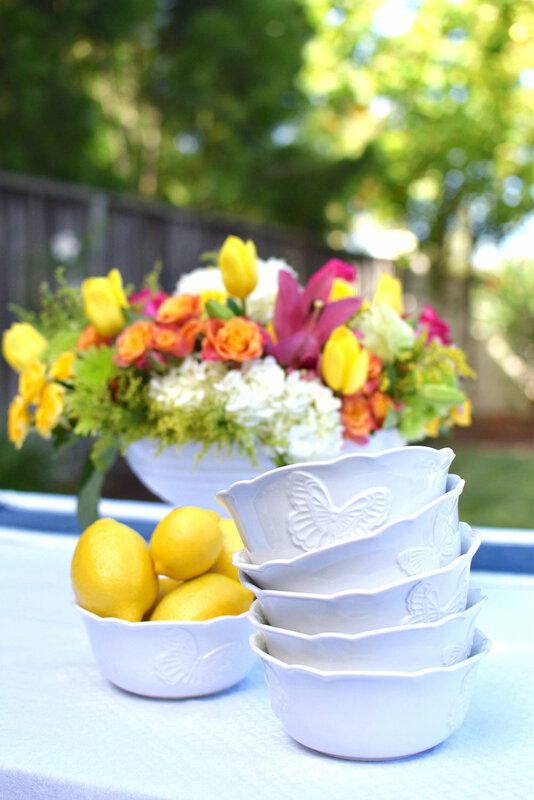 For this setting, we featured Carved Butterfly Meadow white dinnerware, a creamy white collection made of porcelain with scalloped edges and accented with carved butterflies. If you're a fan of the brightly colored Butterfly Meadow collection, you'll love this sister pattern. It's timeless, can be dressed up or down AND has a very sweet, casual + chic vibe. 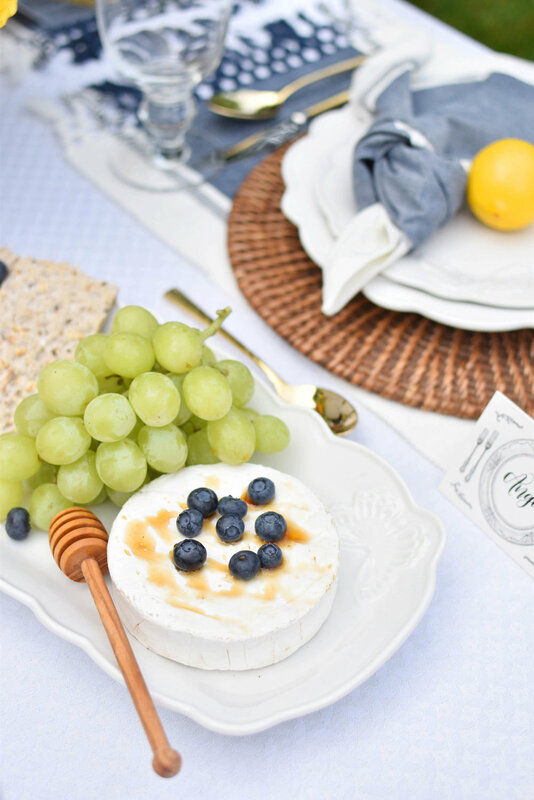 I started with a white patterned tablecloth as a backdrop, layered navy and white placemats and round rattan placemats for dimension, Butterfly Meadow white dinnerware and accented it with Imperial Gold Marchesa flatware for a little sparkle. The French Chefs woven placemats seem to be my go to when I'm looking to add some rustic charm to the table and I use them every season. For those times when my table needs a little something, something, I like to scatter mini-bud vases filled with just a bloom or two snipped from my main floral arrangement or something from my garden. Clip pieces from hydrangeas, mini-rosebuds, or the blossoms from stock or whatever you have on hand. Add a sprig of greenery in some, or mix colors in others for some variety. Super easy and instant pretty! I paired the dinnerware with Tuscany Classic wine glasses to keep it casual. I love a goblet on the table and these also happen to be the perfect glasses for water or ice tea, or in this case, homemade southern sweet tea. I also like a good weight in a glass and this one has it. I'm pretty sure it's almost a requirement to set the table with brightly colored florals in the summer. This mix of pinks, greens, whites, yellow and orange was just the pop of color to make this table feel happy. If I’m on the fence, white is always a good idea and so is a monochromatic look. There's nothing like a pedestal bowl for flowers to give a centerpiece some height and the table a little drama. I found this pedestal at HomeGoods and it's been on repeat ALL summer long! What’s next? Knot the napkins, drape them across each placesetting, add placecards for seating, a lemon on each plate for a pop of color, be sure everyone has a cocktail in hand, and you’re ready to serve whatever's on the menu. Shake it up. Not everything has to be matchy-matchy. Mix coordinating serveware pieces with metal trays, wooden platters and serving boards that can be used for salads, fruit, dinner rolls or even flowers. Here I mixed a Butterfly Meadow hors d’oeuvre tray, Organics Beaded bread tray and a coordinating bowl with wooden servers. And, don't be afraid to mix metals! Gold and silver, copper and silver or a mix of all three is perfectly acceptable. If you're serving fruit or salad in a bowl and like a table that doesn't look cluttered, stack bowls or salad plates on the table almost like they are part of the decor. I like (actually, LOVE) to set a bar cart for coffee, tea and dessert. It’s feels so fancy, especially when you’re serving brunch or lunch. I lined this cart with a piece of my yellow and white checked paper table runner, added a placemat to coordinate with the table, stacked some dessert plates, and added flatware and mini-bud-vases with a few stems from my centerpiece arrangement for some color. There was definitely no time to bake this week, so I picked up lemon and blueberry cake from my favorite local bakery and garnished it with fresh berries and lemon to make it my own. I felt a little guilty for about 5 minutes. Plus, I shopped local, so it totally counts as homemade - right? As you can probably imagine, I have my fair share of dessert plates, trays and cake pedestals. I actually have a good reason for that...I've been collecting them forever and they make everything look prettier, so they're a must have! Here I used Entertain 365 Sculpture Cake Stand and for dessert, I added gray Carved Butterfly Meadow salad and cake plates to the mix. Thank you to our friends at Lenox for partnering with us.